The Federal Trade Commission has filed a complaint in federal district court seeking to stop two related operations and their principals who allegedly facilitated billions of illegal robocalls to consumers nationwide, pitching everything from auto warranties to home security systems and supposed debt-relief services. 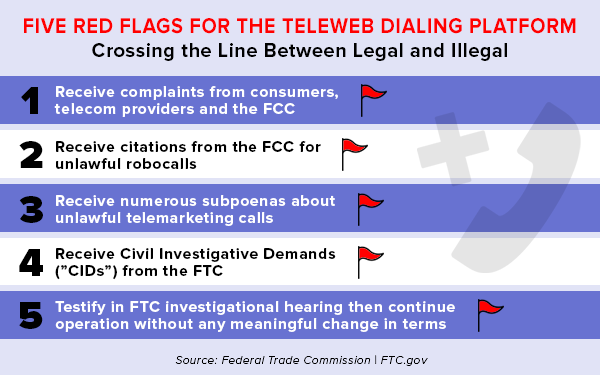 The FTC charged the defendants with violating the agency’s Telemarketing Sales Rule (TSR). 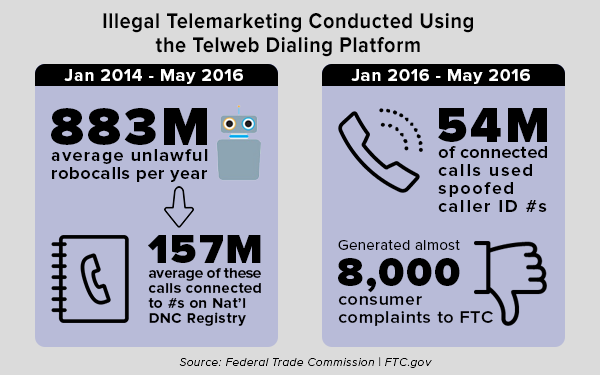 Virtually all telemarketing robocalls to consumers are illegal under the TSR. According to the Commission, James “Jamie” Christiano and the companies he controls operate “TelWeb,” a computer-based telephone dialing platform that can be used to blast out a large volume of telephone calls—especially robocalls—in a short time. For many years, Christiano had a business relationship with Aaron Michael Jones, a recidivist robocaller who has been named in FTC lawsuits brought in 2017 and 2018. Access to TelWeb for most, if not all, telemarketing calls made using the platform flowed through Jones and his business partners -- including Andrew “Andy” Salisbury -- as resellers. Two of Christiano’s companies are named in the complaint. NetDotSolutions, Inc. licensed software to Jones and his clients that allowed them to place autodialed robocalls. TeraMESH Networks, Inc. leased computer server rack space to Jones that enabled him to host, maintain, and update the TelWeb software. 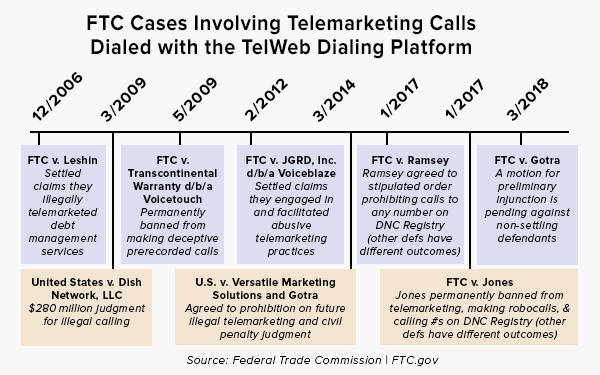 The FTC alleges that from June 2013 to May 2016, NetDotSolutions had only one dialing client—a shell company called Dial Soft Technologies, owned by Jones—which accessed the TelWeb system and resold it to other telemarketers. TelWeb allowed users to make billions of robocalls, including calls to phone numbers on the National Do Not Call (DNC) Registry and calls with fake, or “spoofed,” caller IDs. 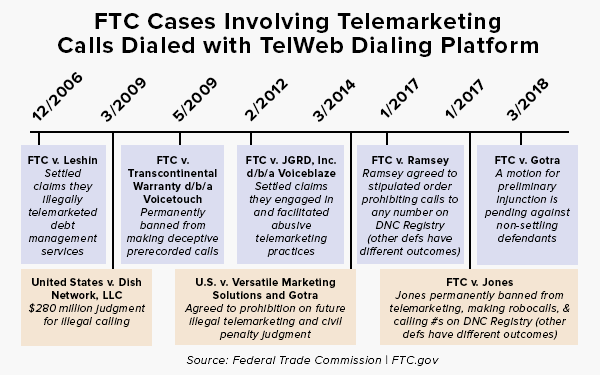 TelWeb also allowed telemarketers to place outbound calls in campaigns designed to leave messages in consumers’ voicemail boxes -- hanging up on people if they answered the phone. In addition to his role in Jones’s robocalling enterprise, Salisbury was the president and part owner of World Connection, a call center enterprise that received transferred calls from consumers who “pressed 1” in response to a robocall message. Those robocalls often were placed with the help of Justin Ramsey, a recidivist robocaller who has also been named in FTC lawsuits in 2017 and 2018. 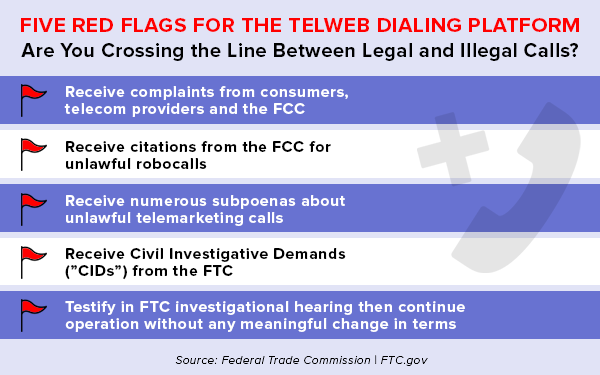 The FTC alleges that, through TelWeb, Jones’s operation bombarded consumers with more than one billion illegal robocalls annually. This includes hundreds of thousands of illegal calls that resulted in consumers being transferred to a World Connection call center. At least 64 million of these calls used a technique called “neighbor spoofing,” which fakes caller ID and makes it appear that calls are coming from a consumer’s local area. Based on this alleged conduct, the FTC charged Christiano, NetDotSolutions, and TeraMESH with assisting and facilitating: 1) illegal robocalls, 2) calls to number on the DNC Registry, 3) calls with spoofed caller IDs, and 4) abandoned calls, in which TelWeb hung up on consumers who answered. Salisbury and three companies related to World Connection are charged with initiating or causing the initiation of: 1) calls with unlawful prerecorded messages, 2) calls to numbers on the DNC Registry, and 3) making calls with spoofed caller IDs. They are also charged with assisting and facilitating TSR violations by others. The FTC is seeking a court order stopping the defendants’ illegal conduct, along with appropriate civil penalties. The Commission vote authorizing the staff to file the complaint was 2-0. The complaint was filed in the U.S. District Court for the Central District of California on May 31, 2018, after being referred back to the FTC by the U.S. Department of Justice.